I do not remember the moment I was born, but I know when I arrived only my mother was there to meet me, my father changed his mind. But I also know with equal amounts of certainty and emotion, that a half century later, had I felt a self-righteous indignation to hold a grudge, than only months before he died, we would have missed our only chance to bond. “When you were about 4 or 5….” Although, the story he shared never happened, it created a father and son moment, that did and it shared happy around. There is such a thing as insurmountable odds, and no matter how much we believe or think we can, the impossible does exist. There is a limit to how fast Usain Bolt can run. Jeanne Calment of France who died at the age of 122. set the stage for how long we can live. And although Brian Shaw dead-lifted an astounding 985 pounds, 986 may have proved one pound too many. There are limits to what we can do, and even though there is no way for us to know what those limits are, we cannot allow what we cannot change to set those limits for us. I was not there, but in 1941 from a small town in Oklahoma, John E. Walker Sr. took his wife and 4 kids and headed north. A better paying job, in a company he trusted in a city a mile high. 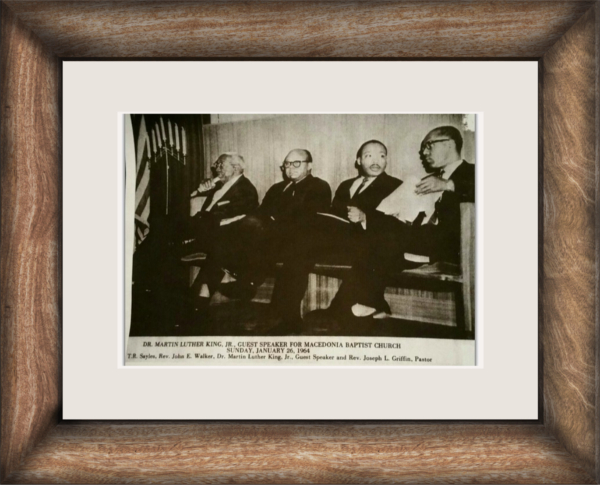 By 1965, John Walker had purchased a home, grew his family to 5 girls and 3 boys, became an Assistant pastor of Macedonia Baptist Church, and when I was about 4 or 5, I remember seeing the photo for the first time, of my Grandfather sitting just left of Dr. Martin Luther King in Denver and I was so proud. We still are. But during the month of December 1965, John E. Walker suffered a heart attack and died. I was born in Denver 8 months later in 1966, my mother was his 3rd child. By then there were only two kids still at home and Etta – his wife – continued to live strong for another 30 years, for a matriarch she would become of 31 grandkids. She would never remarry for John was her only, and for old fashion sake, the only time she worked outside their home, was when she chose to, for John E. Walker Sr. made sure he took care of all that he could, long before he was gone. Chivalry lived on. We do not remind ourselves of our beautiful past and every day stories of kinsfolk who lifted or carried or simply touched the baton enough. Or of opportunities, no matter how fleeting or seemingly insignifigant, we grabbed hold of, allowing once irreversible voids to be replaced with nodding smiles. And that’s too bad, because some memories persists to fill the small crevices where we cannot seem to scratch. It re-energizes the butterfly, and sets ugly back. Children are born with an inquisitive nature and at about 4 or 5, they start to believe they can fly. But more than their curiosity, kids are a resilient lot They fall down and get right back up. If things did not work out so well in little league, they move on to basketball. Masters of the reinvention, one day its Transformers and the next it’s Angry Birds. But something happens to the adventurous self, as we move into adulthood. An accumulative waive of resistance moves into our subconscious, At first it begins to slow us down, before turning happy upside down. But once it turns toward our peace of mind, the fight becomes a struggle, affecting our mental health. The world does not owe us a thing. But we owe it and one another in it believe it or not. Sometimes we hit jackpot and sometimes we roll craps, but by and large, life gives us back, what we put in. New challenges arise nearly every day, and bad dreams cannot be completely held at bay, and sad memories goes with loss, but life is meant to be enjoyed, at least more than not. So whatever our burden that tramples our smile and makes us cry does not deserve the ability to run rickshaw, over each new day of our lives. that we have been building…. since we were about 4 or 5. A good post. It is so important to treasure everyday of your life, jump back up again when you’re down and never lose your inner child. We are formed by our past (good or bad) and holding tight to our memories can be a great comfort. Hello. I could not agree more. Good one, talking straight… Facing 8mpossibilities with such brave attitude, can see us overcome a lot. Sorry for your loss, it’s good you look back at him with pride. Thanks Kendall, the positive strength is in us all. Am grateful to be here… (Big smiles).